Dr. Caroline McKnight attained her medical degree from NOVA Southeastern University College after earning a Masters of Science in Biomedical Science from Barry University in Miami Shores, FL. 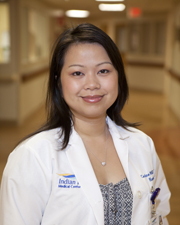 After completing her Osteopathic Rotating Internship, Dr. McKnight performed her residency in Internal Medicine and Pediatrics as Chief Resident at the Newark Beth Israel Medical Center in Newark, NJ. Dr. McKnight is a member of the American Academy of Pediatrics, American College of Physicians and the American Osteopathic Association, and is a board certified Internal Medicine Hospitalist.